Why should celebrities have all the fun? Even if you are not in Hollywood on March 2nd, hosting an Oscars viewing party can still be a fun event for you and your friends. 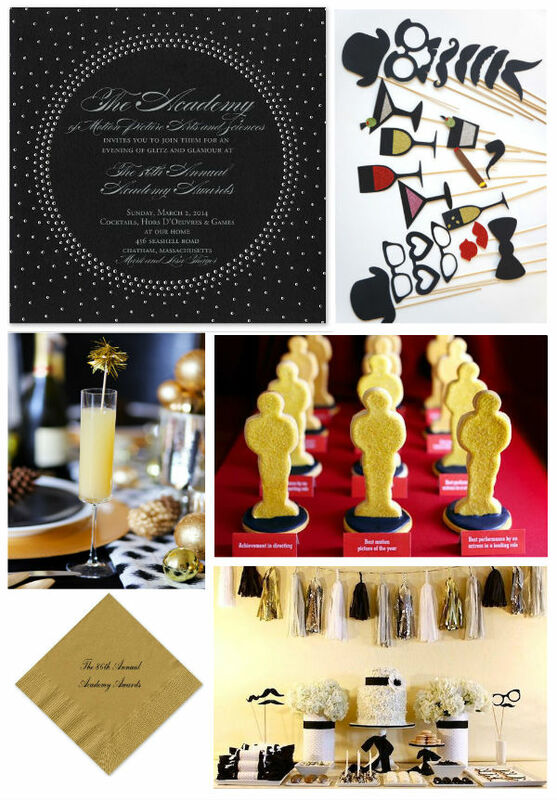 Choose a fabulous Oscars themed invitation to welcome guests over for a night of food, spirits, and awards! Select an appropriate themed invitation to go with your event. If this is a small gathering with popcorn and bar food, opt for a more fun and casual invitation. If you are taking Oscar night as an opportunity to wear something fancy, select a more elegant invitation. Be sure to include in the invitation wording how the guests should be dressed, so that no one gets the "worst look of the night" award! Once you have selected the invite, continue the decor with the same tone you have set. If you have set the night for a casual viewing party, provide food that is fun and fuss-free like popcorn, movie snacks, and cupcakes. If you decide to make this a more formal affair, consider creating Oscar trophy shaped cookies like these on Celebrations.com, and providing a great spread like a black, white, and gold dessert bar. Guests will appreciate little details like personalized napkins and creative cocktail choices. What would a celebration be without a champagne cocktail? We enjoyed this Pear Fizz Champagne cocktail recipe from MeyersStyles.com. So what will you plan for your awards show party? Let us know in the comments.